Bout of Books 10 Grand Prize Winner! Bout of Books 10 has ended but the fun doesn't stop until the Grand Prize Winner is announced! Beth's winning entry came from being a Bout of Books 10 participant. Keep your eye on your inbox, you'll be receiving an email from Bout of Books soon! We would like to thank everybody who signed up and participated in the read-a-thon. We're always striving to make this event the best it can be and we couldn't do that without your enthusiastic participation. Please note that the challenge hosts are responsible for notifying winners and announcing prizes on their own blogs for the mini-challenges. For those that are interested in helping out for the next Bout of Books, we post a call for help roughly a month prior to the start of the read-a-thon - which will be around July 21st for Bout of Books 11. Keep an eye on this blog for that announcement. Once again, thank you to everyone who helped make Bout of Books 10 a success! We appreciate that you love books and that you're willing to shout it to the stars! You have survived Bout of Books 10! In this post, we invite you to link up to your overall progress for Bout of Books. You don't have to create a wrap-up post--it can be your goals post with day 7's progress. Whatever works for you, works for us. Bout of Books 11 will be from August 18th to 24th. The Grand Prize winner will be announced TOMORROW. Challenge hosts are responsible for announcing their own winners. We'll have a #boutofbooks chat between now and August. Following this blog is the BEST way to stay up to date on EVERYTHING. Since we can't reach out to everyone personally to remind them about upcoming events (though wouldn't that be awesome? ), we do our best to keep this blog updated with the most current information. That means you're responsible for following us if you want to receive the latest news. Thank you for making this event fabulous! The end is in sight. The way these updates work is that you post your progress for the previous day (today's link should be to your progress for the sixth day of the read-a-thon). Please include a DIRECT LINK to your update post. Tweet about an author you think deserves a little more love. Squeeze in why. Hashtag with #showauthorlove and #boutofbooks so everyone can see. If you don't have Twitter, comment on this post with your answer. For full challenge information, visit Doing Dewey. The chat will last one hour. You do NOT have to follow the host. If the host gets stuck in Twitter jail, she will take over the @boutofbooks handle. We will use the Q1/A1 system. The host ask the question using Q1, Q2, and so on. You respond using A1, A2. EASY! The way these updates work is that you post your progress for the previous day (today's link should be to your progress for the fifth day of the read-a-thon). Please include a DIRECT LINK to your update post. The way these updates work is that you post your progress for the previous day (today's link should be to your progress for the fourth day of the read-a-thon). Please include a DIRECT LINK to your update post. The way these updates work is that you post your progress for the previous day (today's link should be to your progress for the third day of the read-a-thon). Please include a DIRECT LINK to your update post. The way these updates work is that you post your progress for the previous day (today's link should be to your progress for the second day of the read-a-thon). Please include a DIRECT LINK to your update post. Today is the LAST DAY to GET SIGNED UP. Are YOU signed up PROPERLY? You survived the first day of the read-a-thon! Please note: the form for the sign up will stay open through TODAY. The way these updates work is that you post your progress for the previous day (today's link should be to your progress for the first day of the read-a-thon). Please include a DIRECT LINK to your update post. Welcome to Bout of Books 10! Please note: the form for the sign up will stay open through TODAY and TOMORROW. To kick off the read-a-thon, we're doing something a little different. We're hosting an informal challenge. Take a picture of yourself with your reading pile, your reading companions, the Bout of Books tagline (Are you ready to get your read on? ), or anything else that will let us get to know YOU! 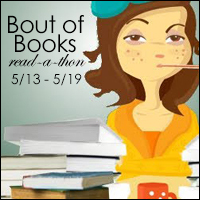 Upload it to any social media site with the #boutofbooks hashtag and CONNECT with other readers! ARE YOU READY TO GET YOUR READ ON? Remember: this linky is for linking up your goals. If you've already done that, you don't have to add your link again. THIS IS NOT THE SIGN UP POST. The sign up post is here. This is for your goals. In this post, you can link to wherever you have your goals posted. To be considered for a prize in any of our challenges, you must have a post about your goals and be actively tracking your progress. This linky will also be available during the first day of the read-a-thon, so if you don't have your goals set yet there is no rush. If you're not sure what information to include, check out our template on the help page. Please make sure this is a DIRECT link to your goal post. If you have questions about your goals or how to track progress, visit our FAQ page. If you can't find the answers on the Help page, tweet us!